During a busy day, there’s not much reason to think about what the cells in your body are up to. Your cells manufacture proteins, metabolize molecules, replicate. You go to work, the dry cleaner, out to dinner, without a thought for the biological processes that make those activities possible. A new sculpture, born from a surprising collaboration, asks you to think again. It’s called “Absorption,” by Portuguese digital artist Rudolfo Quintas, and it developed out of conversations between Quintas and Harvard Medical School cell biologist Tomas Kirchhausen. Kirchhausen studies endocytosis, the process by which cells absorb molecules through their membranes. He and Quintas met in 2013 in Lisbon, Portugal, and later spent three weeks together at Kirchhausen’s lab in Boston. There they talked about ways to make this essential, but obscure, cellular process appreciable on an installation scale. The result is a digital media sculpture, measuring 9 feet across and weighing more than 880 pounds, which mimics endocytosis by regarding you, the viewer, as the thing to be absorbed. 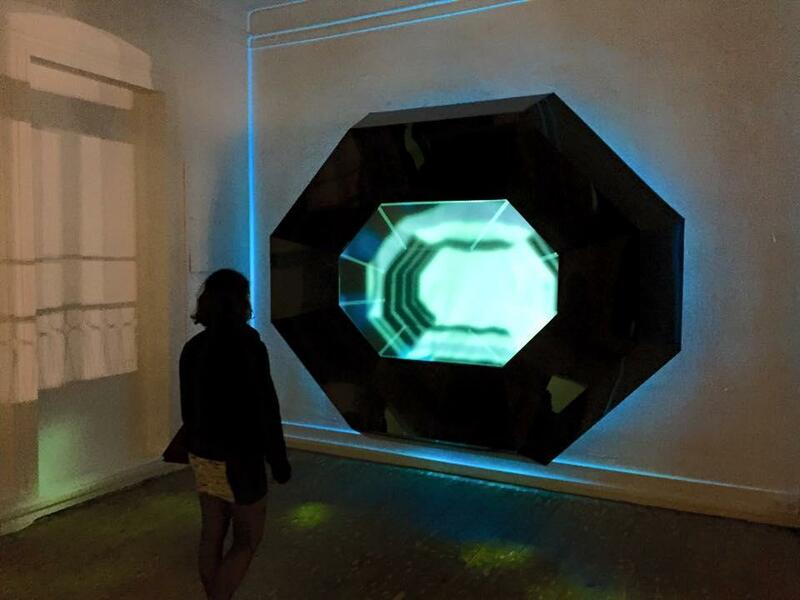 “Absorption,” which was on display at a Lisbon gallery in March, uses sensors to capture body movements, and it takes that data and converts it into a semi-random image, which is projected onto two screens stacked inside the body of the sculpture. Because the image is semi-random, there’s no obvious correlation between your movements and what you see on the screen, a step Quintas took because he didn’t want the piece to feel like a video game. As the viewer gets closer to the sculpture, the image on the screen recedes into a dot that looks distant on the screen. This final move represents the hard-to-define moment at which a cell has completely absorbed an outside object. It’s here, Quintas explains, that the metaphorical work of art and the mechanistic process of endocytosis end up sharing something directly in common.